So what would happen if aliens attempted to coexist with humans on Earth but the inevitable tensions still continued to fester? 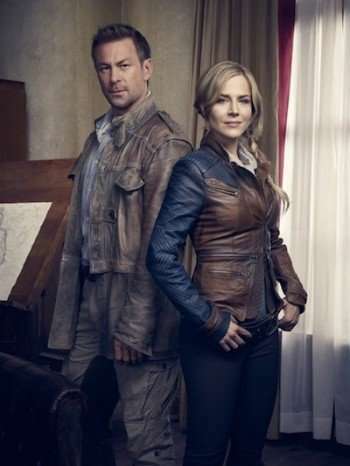 Julie Benz and Grant Bowler headline the new series Defiance, which premieres tonight on SyFy at 9 pm et/pt. Mr. Bowler plays an ex-Marine named Joshua Nolan who brings his adopted alien daughter (Stephanie Leonidas) with him to settle down in Defiance. Benz is the town’s newly appointed mayor, who tries to keep the peace among the humans and the seven alien races. The huge element which makes Defiance unique is that a separate PC, PlayStation 3, and Xbox 360 game recently came out that will attempt to connect both worlds. How in the world does this work, at least in layman’s terms? Click on the media bar and listen to Bowler talk about how the video game and the TV series are connected to each other.